Nothing makes me smile more than hearing a success story from a parent that was able to use the MLG blog to enjoy the game of golf with their child. And even better when they are playing one of the games to win prizes from their dad or mom. My friend Ava, who is quite the little golfer, introduced me to a new game that is a modified version of the “Dollar Game” for chipping. 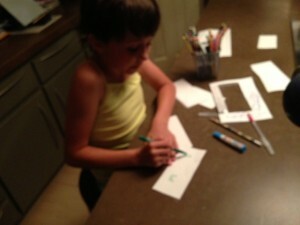 Ava, instead of using dollars, designed her own prizes (in the shape of a dollar)… I think a total of 25 of them in all. Needless to say, with an assortment of prizes like this, any young golfer would have a little extra motivation… Not to mention, her father was pleased as punch to have a game that both enjoyed. All this being said, there is nothing more wonderful than seeing a child learn to love the game of golf; and even better… spending time with their parent. Finally, I want to thank Ava for her creativity and sharing her experience with other little golfers… The Ava Game of 25 will live forever! Oh, I almost forgot, Ava and her parents will be going to the beach this summer… she earned that prize on her first outing! Ava and any other golfer out there, if you have a favorite game, please continue to share.